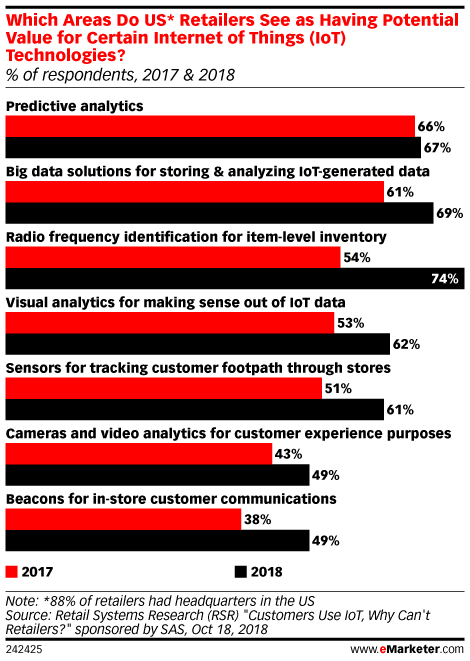 Data is from the October 2018 Retail Systems Research (RSR) report titled "Customers Use IoT, Why Can't Retailers?" sponsored by SAS. 116 retailers worldwide were surveyed online during July-September 2018. Respondents' headquarters were primarily in the US (88%) but also included Canada (1%), Europe (1%), Latin America (1%), and the UK/Ireland (9%). Respondents represented retailers who sold in the following product categories: apparel (17%), boutique retailers (3%), FMCG (27%), general merchandise (24%), hard goods (20%) and hospitality/retail services/entertainment (8%).